How to Import iTunes Video Clip to iMovie? It's very easy to import some plain video clips to iMovie for creating a professional looking effect for your iMovie project, but you'll find it's impossible to directly import any iTunes video when you try to add a video from iTunes. Sure, you may use a capturing screen tool to record an iTunes video, but it would sacrifice the quality of the iTunes video. Don't worry, we'll explain here how to import iTunes video clip to iMovie without lossing video quality . iMovie is an amazing video editing program that comes as part of iworks on all Mac computers and iPads. This program includes features such as: changing the speed of clips, adding text to clips, visual effects, music, and voice overs. Besides that, Apple iMovie has added support for 4K video, and more sharing options. And it still maintains some of the best storyboard-based movie making tools for novices—Trailers and Movies—along with excellent green-screen and soundtrack capabilities. 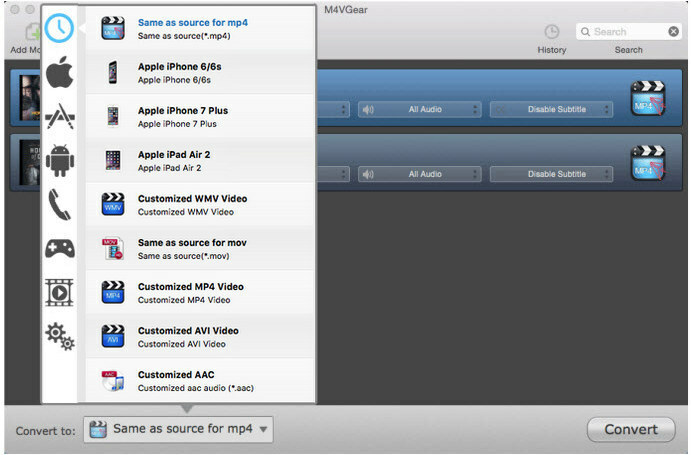 iMovie Supported Video File Formats: MP4, MOV, MPEG-2, AVCHD, DV, HDV, MPEG-4, H.264. Right now, iMovie doesn't supports adding iTunes M4V Videos as all of iTunes video are locked down by Apple's Fairplay DRM system, but that doesn't mean there is no way to import iTunes videos to iMovie for editing. If want to import iTunes Video, you'll need to use a third-party iTunes DRM remover tool to decrypt the DRM firstly. Finding a great iTunes M4V Converter can be hard - with so many choices, you don't know what works great and what works like a piece of junk. 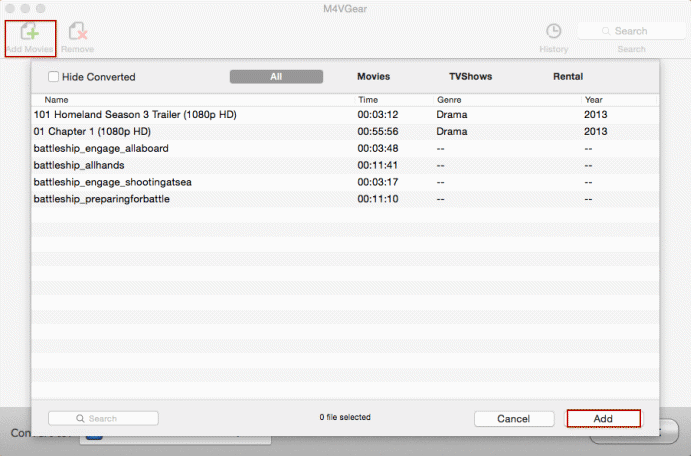 Thankfully, there is an awesome iTunes M4V to MP4 Converter called M4VGear DRM Media Converter. That's right - with this tool, you can get rid of DRM from iTunes M4V videos, split a whole M4V video to videos clips and then convert to MP4 video files for importing to any video editing program, such as iMovie and Adobe Premiere Pro. We'll show you here how to import iTunes video clips to iMovie. Tutorial: How to Easily Import iTunes Video Clips to iMovie? The default output video format is "Same as source for MP4". You can change the output format after "Convert to" on the bottom left. Output format as "Same as source for MP4" and "Same as source for MOV" are highly recommended, which enables users convert at faster speed while keeping all subtitles and audio tracks (including Dolby 5.1 audio track). Then you can click "Custom" tab and input the Begin and the End time to clip the iTunes video. Ready? Just click "Convert" button to start converting iTunes Movies to MP4 format. After conversion, you can find the well-converted video clips by clicking the "History" button. Next, you can directly import the iTunes video clips to your iMovie for editing. 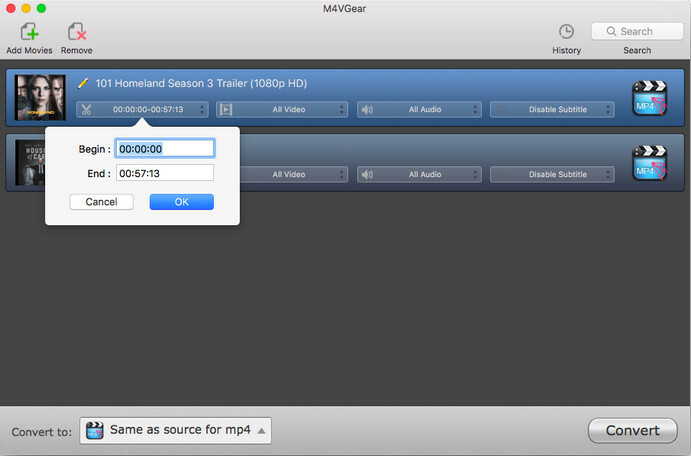 Note: You may find the trial version of M4VGear only converts 1 minute of iTunes movie for free. Do not worry. It is the limitation in the trial version of M4VGear. If you want to convert the full movie with M4VGear, purchase the full version of M4VGear now at limited-time price $44.95 ($49.95).